Size: 620 sq.ft. - 1350 sq.ft. Marasi Riverside is one of Dubai's most iconic project - the combination of apartments& it offering the first ever water homes, floating restaurant, retail options, and leisure facility in the well planned community of Dubai Creek. Marasi Riverside is the perfect mix of commercial and residential with a range of world-class facilities and activities to suit every lifestyle on the banks of Dubai Water Canal. This project by Dubai Properties is a collection of waterfront apartments in the heart of Business Bay. The project is available in in different sizes apartments. Marasi Riverside gives choices of 1 BR, 2 BR & 3 BR modern apartments & 2, 3 and 4 bedroom luxury unique water homes.1 Bedroom size ranges from 620 - 731 sq. ft., 2 Bedroom size ranges from 1,115 - 1,129 sq. ft. & 3 Bedroom size ranges from 1,350 sq.ft. It hosts a range of facilities that offer residents the lifestyle they aspire to. These spacious apartments come with sweeping views from the balcony of Dubai’s most famous landmark. The residences offers quick access to Sheikh Zayed Road and the Dubai Metro - the ultimate in connected city living. Business Bay Water Homes are dedicated to The Park, The Yacht Club and The Pier. Marasi Business Bay is designed to provide entertainment and leisure experiences. The location is rated among the most promising areas embedded with fun, entertainment, leisure, comfort and luxury. Riverside homes at Marasi Business Bay starts with a panoramic view of water bodies and other iconic locations of Dubai. The other main destinations like Palm, Jumeirah beach, Burj Khalifa, Dubai Mall and Safa Park are situated in the vicinity of proposed site of Marasi Riverside. 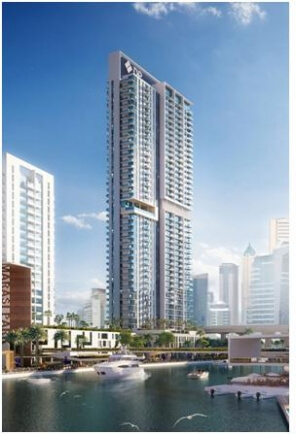 The Riverside by Dubai Properties is in quick access at Dubai Water Canal, UAE. Marasi Riverside Facilities includes 24 Hrs Security, Business Centre, Children's Play Area, Community Centre, Easy Access to Transportation, Games Room, High-quality Fixtures, Iconic Views, Landscaped Gardens, Modern Community Centres, Modern Interiors, Private & Guest Parking, Retail Facilities and many more. Schools: - Creative Kids Early Learning Centre Business Bay Branch, AUFUQ AL EBDAA Education Center Dubai, Hummingbird Nursery Bay Square, Jumeirah International Nursery. Hospitals: - Biel Group - Dubai, Aig Clinics Jumeirah, The All England Practice. Restaurants:- Zen Restaurant, Circle Cafe, 25 Degrees North - Bay Square, Pak Sufi Restaurant. Coffee Shops: - BookMunch Cafe, Chin Chin, Starbucks Coffee, Zoga Yoga Cafe. Grocery Store: - West Zone Fresh Supermarket, Choithrams Bay Square, Spinneys Market Southridge.